TESTIMONIALS - DEVON YURTS Glamping in Style! I want to say a massive thanks from myself and my wife for such a fantastic few days, stunning camp and facilities, are a true testament to the hard work you've put into setting Hemsford camp up. I’ve returned home so relaxed and refreshed and it’s all down to the last few days staying at your camp. Thank you very much, we would love to visit again with our children. "Had a wonderful few days away in the Dart yurt. The yurt was beautiful and was so homely. Liz was incredibly welcoming, she has thought of everything to make our stay home from home. We loved sitting outside at night with the fire burning and toasting marshmallows and in the morning picking blackberries whilst watching the horses. We’ll be booking our next stay again soon, thank you for giving us a truly relaxing break. "Just back from a Great couple of days in the Dart yurt the log burner is fantastic for the cool evenings and chilly mornings, a couple of logs warms the yurt in no time and stays warm for ages, Liz the owner was very welcoming and informative, Good base to visit the surrounding area/towns." Stayed here for one night as a surprise for my 50th birthday. We had the place to ourselves and it was a wonderful, peaceful experience. The owner could not be more helpful. We will be back. Thank you again. Just wanted to say thank you from both of us for a really enjoyable stay in your shepherd's hut. We loved the hut, and the surroundings. The local pub was great too. The hamper was supberb and lasted us both days for brekkie - we had fun cooking it camping style too. Apologies for the delay in getting to you, thank you for your understanding. We hope to visit again one day, perhaps we will try out a yurt next time! I just wanted to write and thank you for such a chilled couple of days that we spent at your Yurt camp. We really had a fantastic time and yurt experience and it was lovely to meet you, the hens and the ginger cat (sorry I have forgotten his name! ), and we also saw the fledgling buzzard flying around and squawking for more food! The other guests who were staying were also very lovely and easy going, so it seems that you are attracting a good crowd, who appreciate the outdoors and something a bit different. If we are ever passing your way then we shall pop in and / or come and stay again"
Just wanted to say a huge thank you for such a lovely stay and for being such a kind host to us all. I would absolutely recommend a mini break at one of your beautiful yurts to anyone and we hope to return someday! We just wanted to drop you a line to say what a wonderful stay we had in Devon last weekend. We loved the Shepherds hut and you made us feel very much at home. We will definitely be back soon I hope. Hi Liz, just wanted to say thank you again for a fantastic welcome. Such a tranquil place, so relaxing even with the rain :-). The yurt was fabulous. Zoe and I can't wait to sort out when we can come again. "Hi Liz, Just wanted to send a quick note to say thank you for such a brilliant weekend. It really couldn't have been better, we all had the best time, especially Gemma! Expect a glowing Trip Adviser review from us soon! Wedding was on Saturday and it was absolutely beautiful! Thank you again, Claire"
Thanks so much for your flexibility around booking, the kids had an amazing time, it was a great experience for them, truly a party to remember!...and for us surprisingly! "Thanks for the welcoming atmosphere at Hemsford and the lovely relaxing break. The yurts were great. We tried a tipi last year, but I didn’t like my head being so close to the ground on the futon mattresses (don’t like bugs! ), so it was much nicer to have a real bed, and a real door to get in & out. Wishing you all the best for the next season. 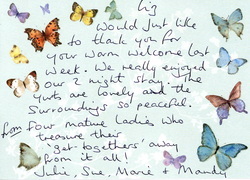 "Hi Liz, just wanted to drop a quick note to say how much we loved the yurt experience. The location was great and the children loved feeding the chickens, stroking the horses and in particular the pond dipping. We would love to come back another time - thank you for being such a wonderful host. PS - the eggs where the best we've ever had..."
Will definitely be back glamping in a yurt and will highly recommend it to others Many thanks - Love Barry and Laura"
"Thank you so much for fitting us in for some R & R - yurt style, We LOVED it and were cosy and warm despite the rain. We are both in agreement that its been our favourite night away ever and will be back to stay again! 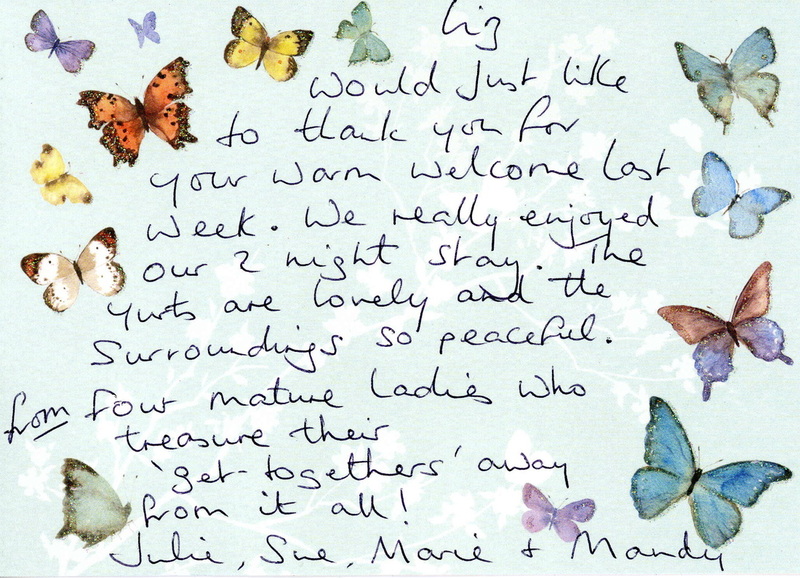 Thank you again, Kate and Hannah"
"Thank you so much we had a fantastic time here - really relaxing. Definitely our kind of camping - see you soon - Kieron and Kate"
"We have thoroughly enjoyed 5 nights in the yurt with our 3yr old grandson. Lots to do in lovely South Devon and facilities here just great - Caroline, Mark and Oscar"
"You have a really lovely place there, I don't think a one night stay was nearly enough! - Ziggy"
"A very nice stay for us - too short to enjoy all this beautiful countryside. The atmosphere is plenty of love!!! We wish you the best.